With special thanks to motor sport historians, John Medley, Brian Lear and Barry Lake. 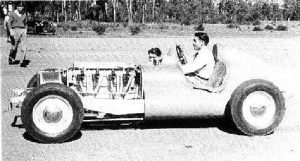 Owned and built by Ron Ewing this race car is fitted with a Buick 8/40 engine fitted to a Terraplane chassis, with a Lancia gearbox. The car first ran at Bathurst, Easter 1940, then modified and raced after WWII at the Easter Monday Speed Trials at Marsden Park Airstrip where it was was beset with overheating and misfiring problems. Next appearance was at the NSW Sporting Car Club circuit race meeting in June at the same venue. It again was dogged with misfiring problems as for these two events the car was fitted with four Amal carbs – the float bowls are clearly visible in the photo. Subsequently the original carburettor was refitted.